With all the different types of SUP leashes on the market, how do you know which leash is right for you? Straight or Coiled? One main difference among paddleboard leashes is whether they are (1) straight or (2) coiled. Pros: better for paddleboard surfing waves because your SUP can pull farther away from you in a wipeout for safety to prevent your SUP from smashing into you. Cons: the straight leash is a lot of cord that sits on the water to create additional drag that can slow you down. Pros: optimized for flatwater paddleboarding, like in bays, lakes or rivers where you prefer to have your paddleboard close to you without having to worry about the wipeout / danger component of your board being too close to you. The coils will still unwind some with a pull, but then coil back, bringing your paddleboard closer to you. Cons: not optimized for paddleboard surfing waves, where you prefer to have distance between yourself and your SUP in the event of a wipeout. Hybrid paddleboard leashes combine the best of both worlds, with half the leash coiled where it's closest to your ankle, and the other half flat where it attaches to your SUP. This provides a balance between cutting down on drag and making sure you have the paddleboard leash length you need. Size - How Long of a Leash: just like many things in life, size matters. Many SUP leashes come in 10 foot sizes, and that is a general "standard" size for a leash. But the longer your paddleboard, the longer your leash should be. So if you have a 12 foot SUP, you should look at a longer leash. The old surfing rule that a foot of leash per foot of surfboard should serve you well with paddleboard leashes too. Brands: The paddleboard leashes on StoreYourBoard are different brands, which reflect quality and price. 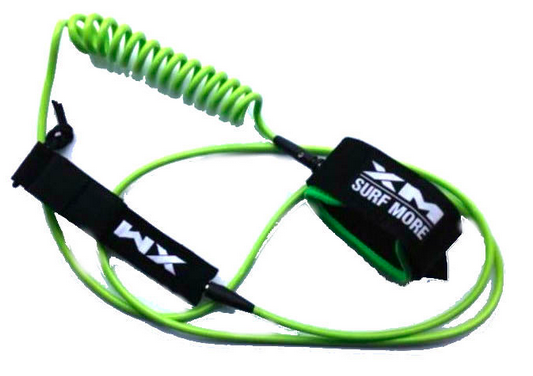 Ocean and Earth is the higher-end leash, and XM and Sticky Bumps are more intermediate level leashes.